Are you on LinkedIn® and don’t know what to do once you’re there? 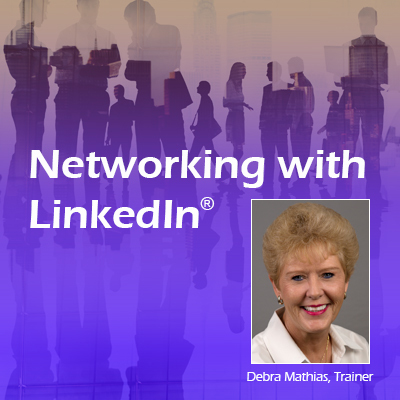 Debra Mathias’ coaching helps you to know who to connect with, why to connect, and how to make money doing it. Learn how to keep notes on your connections, organize them into groups for easy reference, market your business and make lasting relationships by networking with the groups and companies that you connect with. • Learn profile optimization and organization: help people find you, understand your expertise, and want to connect with you. • Turn your connections into clients. Networking with LinkedIn shows you how to ask for appointments and get business from connections. • Know where to include interesting personal accomplishments to your career summary to help people get to know you in a different light. • Understand what groups to join that can increase your business and how to participate in those groups to increase the visibility of your profile and company. • Decide when to consider upgrading to LinkedIn Premium® to benefit from the InMail® function, and advanced search options.